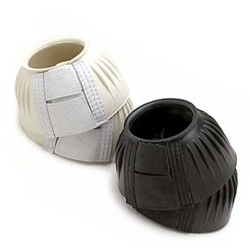 Premium Ribbed bell boots offer protection for your horse. Double leather like tape closure for ease of use. These double closure ribbed bell boot with two layers of really sticky touch tape with no tedious stretching over dirty hooves. Roma Quality for your leg protection. Products made from the finest materials with a complete line horse boots. Depend on Roma products for great quality and price.